Magerealm, the free to play action MMORPG from GTArcade, is excited to introduce a deadly new Hero! Introducing Red Lotus, the female assassin that never misses her mark. From the land of the Far East, Red Lotus was born into a clan of assassins that were infamous for their ruthless efficiency. Trained since childhood in the art of assassination, Red Lotus has acquired a deadly set of skills that she sells to the highest bidder. She is the only one in her clan to have never failed an assignment. For all those unfortunate enough to become her target, a brief flash of red is the last thing they will ever see. Red Lotus’ ability to eliminate targets is second to none. As one of the strongest offensive heroes to date, the majority of her skills are designed to strike heavy damage and take out enemies quickly and efficiently. While most of her skills are focused on dishing out heavy single-target damage, she also possesses a short range AOE ability that inflicts silence. Use this to strategically cripple foes before going in for the kill. But red Lotus is not without defenses; with the ability to vanish into the shadows and avoid damage for a set duration, Red Lotus can continue to fight in the most dire situations. However she only has one defensive ability so caution should be taken. Strike fast to kill a target and give your team the numbers advantage. 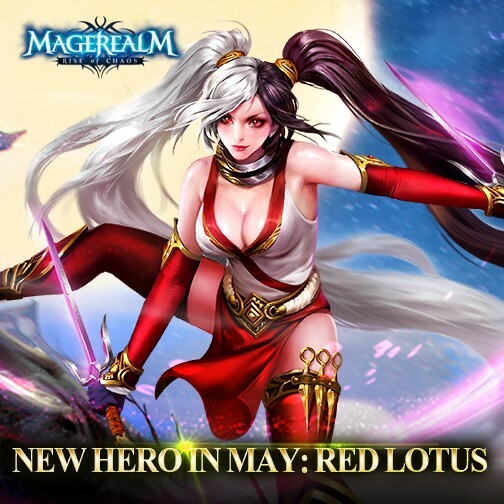 Are you ready to employ the deadly Red Lotus to execute your enemies? Join one of the hottest free to play MMORPG’s and experience an epic fantasy world of magic and steel! Follow Magerealm on Facebook and visit the official site and forums to get the latest news and participate in rewarding events. Magerealm_New Hero: Shieldbearer is here!